2019 SPRING FISH DAYS ARE RIGHT AROUND THE CORNER! HERE IS A LIST OF THINGS NEEDED PRIOR TO FISH DAYS. All orders need to be placed at least 2 days prior to the date scheduled. Aerators are not mandatory, but some type or aeration is good to help keep fish alive longer. There is no such thing as too much water! Too much is always better than not enough. Trash cans, 55 gallon barrels, water tanks, etc. work best for hauling fish. We recommend 5 gallons of water for every pound of minnows. Does your pond have a weed problem? Are you catching more algae and moss than you are fish?If so, we may have the solution! NEMO carries a wide selection of pond treatments and aeration. Head on over to the NEMO pond products tab and see if you can find a solution to your pond's problems. With the proper aeration and the right amount of treatment, you can have the perfect looking pond in no time! ​We are now raising Great Lakes Strain Yellow Perch. We have saved back around 15,ooo smallmouth to have some for sale this spring. 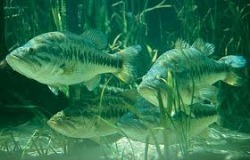 They were moved out to the pond in November when they were 4.25 inches long. They should be 6 inches + this spring. These fish will not last long. We have thousands of koi fish in stock, ready for pickup, and tens of thousands in ponds, waiting for their new homes. All of our fish are collected by a licensed veterinarian and are health tested to state requirements. If you have any questions about how to stock your lake or how this fishing is at Mark Twain Lake, feel free to call or email us and let our experienced pros help get you on the right path to one of the American dreams.